Ireland will hold a national referendum by June 2018 on whether to repeal the constitutional amendment that bans most abortions. A referendum on removing blasphemy and “woman’s life within the home” language in the constitution is slated for next October. A third referendum on extending voting rights to Irish citizens living outside the Republic will take place in 2019. 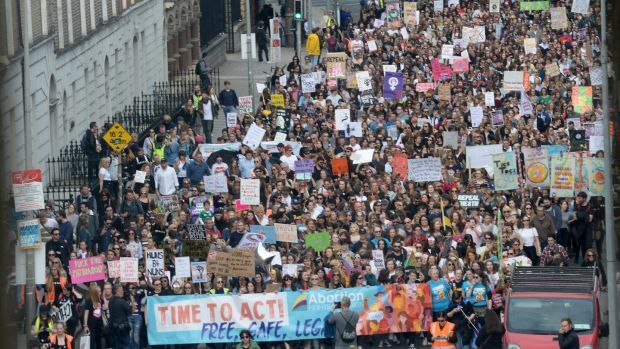 Ironically, announcement of the abortion referendum comes about nine months before the vote, set to occur the same summer that Pope Francis is scheduled to visit the World Meeting of Families in Dublin. Dáil Éireann, the national legislative assembly, still must fix the final dates and, more importantly, the language for the referendums. On the abortion issue, the outcome could turn on whether the language is considered too liberal, or still restrictive. The Eighth Amendment, passed in 1983, gives an unborn child a right to life equal to that of its mother. At the time, Ireland was seen as one of the most conservative Catholic nations in the world, but a series of church scandals and growing secularism have the country rethinking many of its government’s positions. The United Nations has called the amendment a violation of women’s rights. March for Choice in Dublin, 30 September. Photograph by Dara Mac Dónaill, The Irish Times. This entry was posted in Politics, Religion and tagged Eighth Amendment, Leo Varadkar, referendum on October 1, 2017 by admin.